Preheat oven to 400F. Lightly butter an 8 inch baking dish. Steam or microwave asparagus only until barely tender; immediately rinse under cold water to stop the cooking process. Pat dry and set aside. Heat milk in the microwave until it is hot but not boiling. Meanwhile, in a saucepan over medium-low heat, melt 3 Tbsp of butter. Add the flour, and whisk for 1 minute. Slowly whisk in hot milk. Increase the heat to medium and bring milk to a simmer, stirring constantly. Reduce heat to medium-low and continue to simmer, stirring constantly, until thickened (about 5 minutes). Whisk in wine, Dijon mustard, and nutmeg. Add cheese and whisk until melted. Remove from heat and season with salt and pepper. Arrange bread slices, overlapping as needed, in the prepared baking dish. Spread chicken over the bread and top with asparagus. 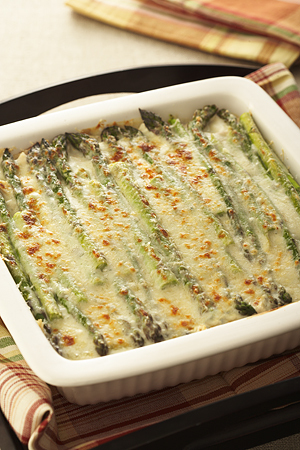 Pour the cheese sauce over the asparagus and sprinkle with the Parmesan cheese. Bake until the sauce is bubbling and golden brown – about 20 minutes. Let stand 10 minutes before serving.